If what you seek is pristine rainforest teeming with monkeys, macaws, and mysterious beasts, the area around the Golfo Dulce is the place to go. From the quiet waters of the gulf and its mangroves to the National Park of Piedras Blancas, nowhere else in Costa Rica will you find such intense and diverse tropical flora and fauna. If you want to escape other travelers, try the virgin nature reserves around Golfito on the mainland just across the Golfo Dulce. If the jungle isn't challenge enough, test your surfing skills on one of the world's longest lefts in Pavones, or sip the milk of a freshly cut coconut and enjoy the sunset on the area's secluded beaches. 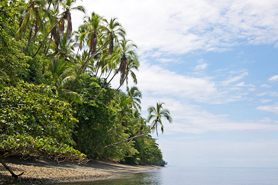 Golfito, home of the former headquarters of the United Fruit Company, sits on the northeast coast of the Golfo Dulce. Drastic regional cutbacks of banana production in 1984 led officials to save the town's economy by establishing a duty-free zone in the northern end of the city. Now, the famous shopping area draws locals year-round and fills hotels on the weekends. For most tourists, it serves as a stopover to more exciting destinations. The Piedras Blancas National Park was established in 1992 as an extension of the Corcovado National Park. In the east the park borders the Golfito Forest Reserve and connects in the west with the Corcovado National Park by the forest corridor of Rincon. The Piedras Blancas National Park covers 30’000 acres of undisturbed humid tropical lowland primary rainforest and 5’000 acres of secondary forests, pasture land and rivers consisting primarily of hills of varied steepness, over one hundred stream valleys, a river plateau and coastal cliffs and beaches.